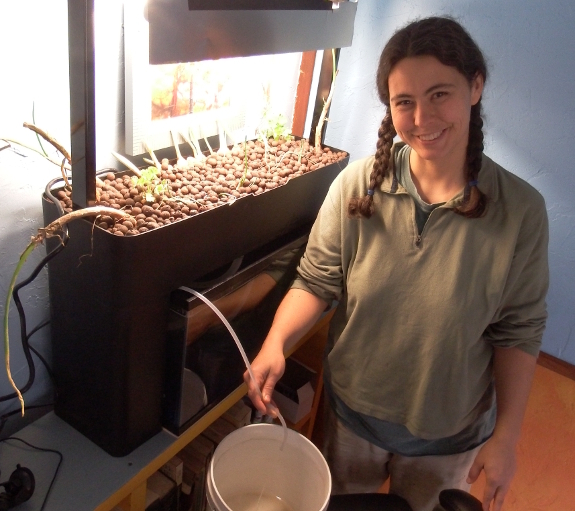 Even though we started with a kit, no aquaponics system is truly plug and play. Instead, you have to build up handy bacteria to change fish waste (ammonia) into the form of nitrogen plants can use (nitrate). While you can do this by putting some fish in your tank and hoping the bacteria will grow faster than their poop will build up, most folks cycle the tank using chemistry instead. Cycling is pretty simple. 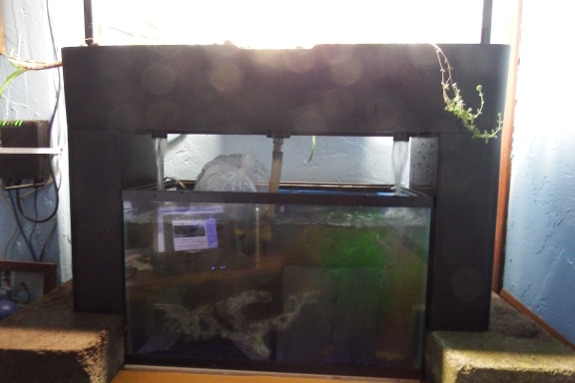 Basically, you set up both your tank and grow bed (with pump running), then you add a source of ammonia to bring the content of the water up to 4 to 6 ppm. After that, it's just a waiting game while the bacteria accumulate and do their job. So where do you get ammonia? Supposedly, you can buy it in the cleaning section of some stores...but it's hard to find straight stuff without dyes, perfumes, and soaps. I went for the cheaper approach --- aged pee. 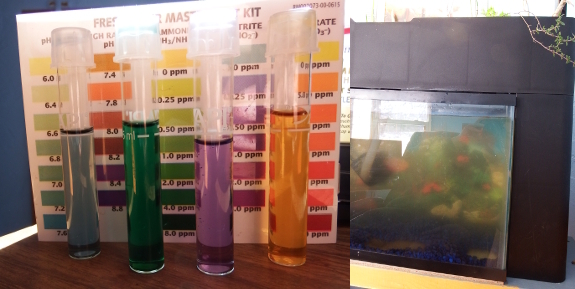 Half a cup of aged pee in a ten-gallon aquarium actually overshot the mark a bit, hitting 8 ppm. I could have changed out a bit of the water to bring the aquarium back into balance, but I also had another ace up my sleeve --- a quart of wild pond water added to the mix. I figure seeding some beneficial microorganisms might let me get away with higher ammonia levels than are really recommended. Hopefully the pond water will also lower the usual cycling time of three to six weeks too. The sooner I can add fish, the better! I recently learned about Wabi-Sabi. A Japanese world view centered on acceptance of transience and imperfection. This video I made from 2009 might come close to capturing one of those moments. I've been getting a lot of aquaponics questions both on and offline, so I thought I'd sum the most common ones up in a single post. Questions have been paraphrased to save space. "What kind of fish are you putting in your tank? Are you going to eat them?" I'm very new to aquariums, so I was surprised to learn that a 10-gallon tank is actually too small for even a single goldfish. The aquaponics aspect also mean that you're better off raising tropical fish, since a heated tank makes the biology of the waste conversion work better. To cut a long story short, we'll probably stock the tank with five guppies once the setup has cycled. Or possibly with some of AquaSprouts' other suggested ornamental combos: 8 neon tetras plus 4-6 dwarf corydoras catfish; 5 tiger barbs plus 2-4 kuhli loaches; or 5-7 zebra danios plus 2 dojo loaches. Nope, we won't be eating our teaspoon-sized fish. "Are you growing potatoes? If not, what are those little round things in the grow bed?" 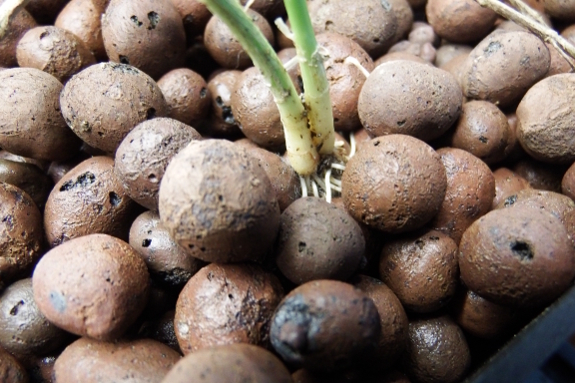 The growing medium in a hydroponics or aquaponics system needs to be something inert that holds water between drenchings but doesn't disintegrate like soil would to fill the water below with gunk. In this case, we're using expanded clay aggregate --- an extremely light-weight, rock-like substance formed by baking clay at a high temperature. You'll soon see some rock wool enter the setup when I start my basil seeds since seedlings can't handle the large spaces between the clay pellets. 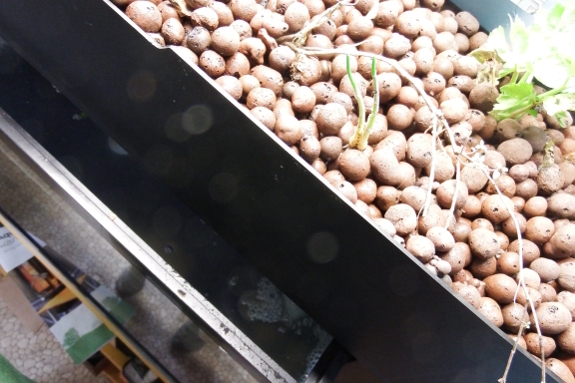 "Are you concerned about the sustainability of your aquaponics setup?" I consider our tank in the toy category rather than the tool category. It's 95% for prettiness and 5% for production of herbs, and I'm well aware I could get the same production results with less input of electricity by growing the plants in a pot on a shelf. But it'll be fun and educational to watch the ecosystem develop, and I figure that's worth a little electricity! "Doesn't cycling with pee as your ammonia source mean the tank stinks? It actually did smell worse than I'd expected, but the odor disappeared within 24 hours. Perhaps that's a sign that my ecosystem is starting to work (although there's still no measurable presence of nitrite in the water). Stay tuned for more nitty-gritty details as the project progresses! We added a small strip of flashing to block some light and reflect the rest back. The trouble with me learning about the joys of paint is that now every project takes three times as long. 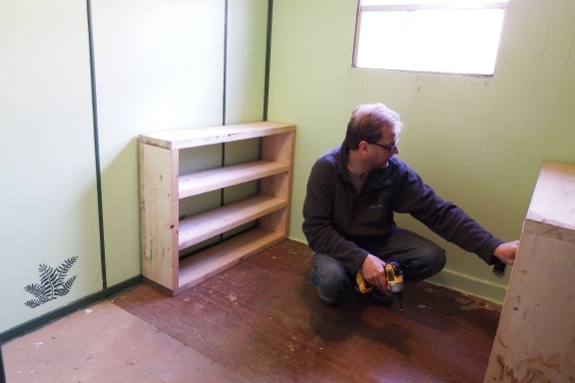 Gotta lay down some primer and then pretty colors before Mark can start putting it all together. I'm attempting to keep the obsession in check, though. 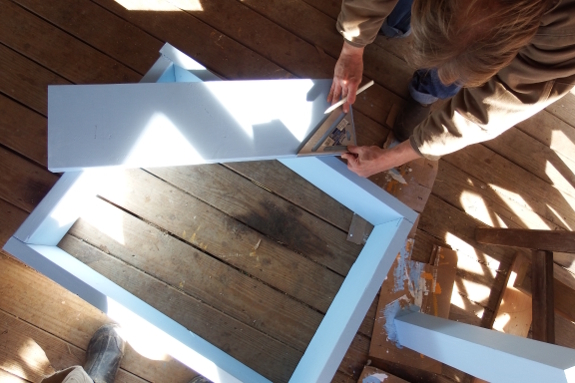 For example, I didn't paint the underside of the upcoming sofa loft...although I really did think about it. We finished up the board cutting for the new elevated storage loft. For story reasons too complicated to get into here, I'd like to have most or all of the living quarters down in a gondola suspended below the balloon. 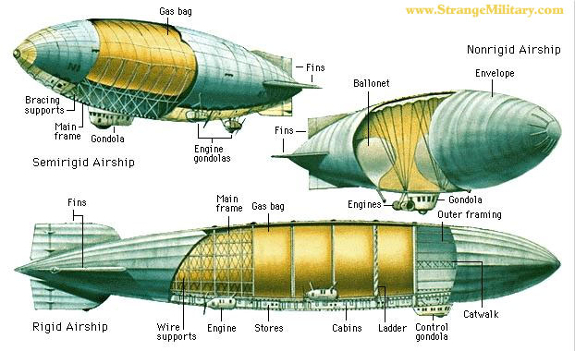 So more like the semirigid or nonrigid airships in the diagram above, although I'm not actually set on it not having a rigid frame. 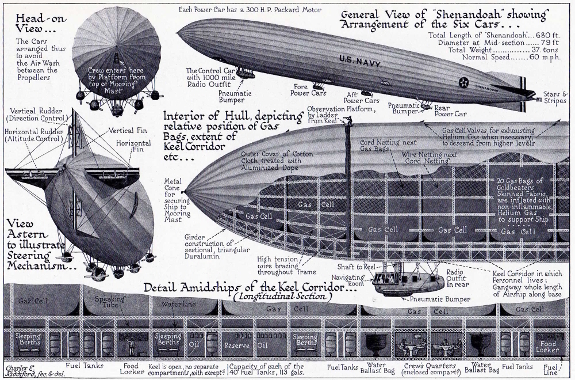 The Hindenburg had capacity for 72 passengers and 40 crew members. It was 250 meters long and 40 meters in diameter and used hydrogen gas to stay afloat. I'm thinking of using hydrogen gas in my story too despite (or perhaps because of) the fire potential. 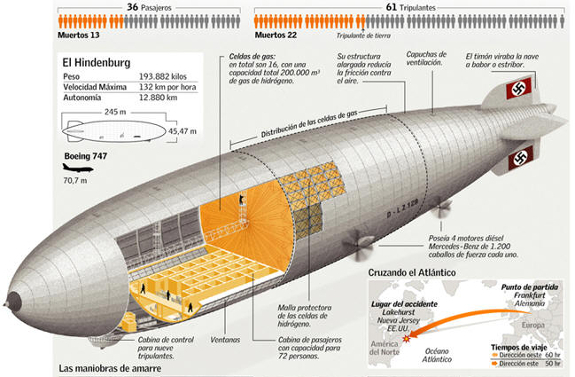 How big do you think my airship would have to be to need about 8 to 15 crew members while having capacity for about 15 passengers (hotel-like setting, not just seats) with an equal-sized cargo space? 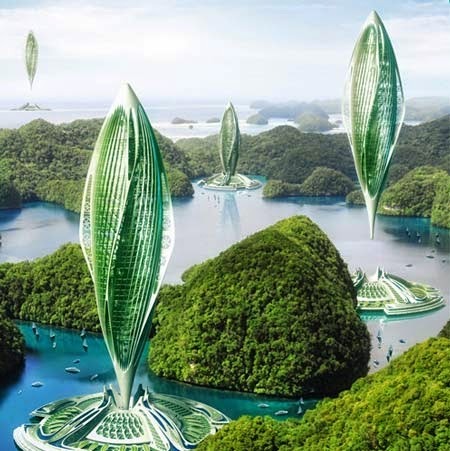 I'd like to create the hydrogen in situ using Chlamydomonas reinhardtii algae, similar to Vincent Callebaut's dream, but built like a ship rather than a city. 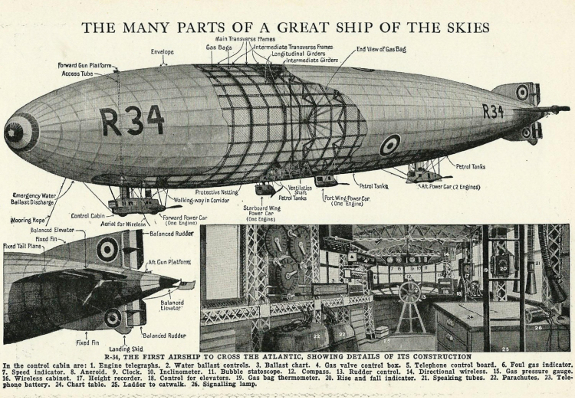 What kind of lightweight medium would you grow algae on in an airship setup? Here are a couple of other diagrams that floated my boat. (Click on any image to find the source of the pretty pictures.) Now I'm ready for your ideas --- go! 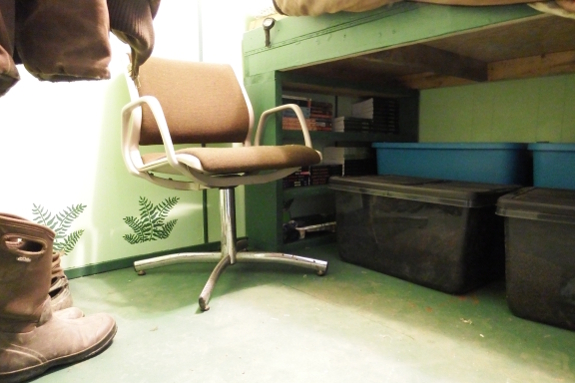 The new elevated storage sitting area is a huge improvement. Our elevated sofa bed is complete! Time for a long, step-by-step post showing how we did it. 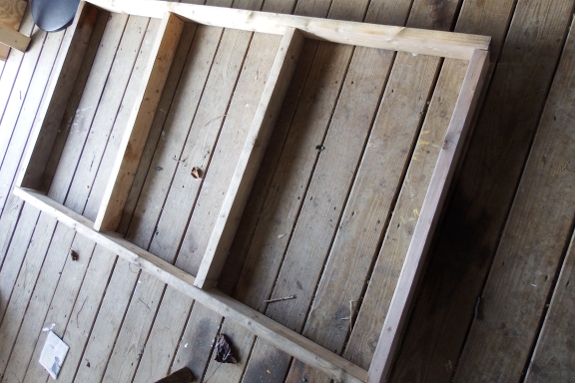 As Mark mentioned earlier, we began by building the base for the mattress to sit on top of. Since the sofa may hold multiple people at a time, we wanted it to be sturdy, so we built a rectangle out of two-by-fours, added two braces in the middle, and topped it all off with a big sheet of plywood. Next came the supports. One end will be open to the room, so we decided to make a bookcase to both hold the sofa aloft and increase our storage area. The other end butts up against my office area, so we simply cut four-by-fours to act as legs there. 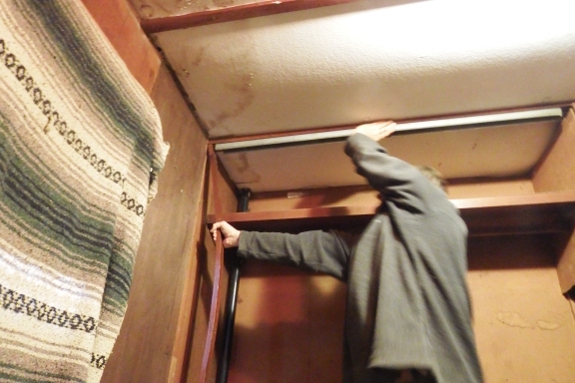 Inside, we pulled the ancient futon out and started preparing the space. 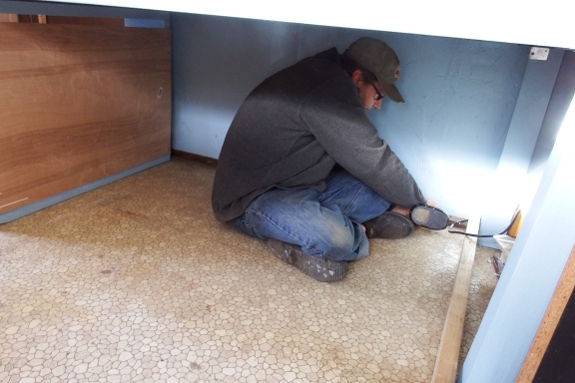 Our trailer came with carpeting, which we ripped out nearly right away. I never got around to dealing with the metal rails that held the edges in place, though, and one strip was going to get in the way. So Mark pried it loose, nails and all. 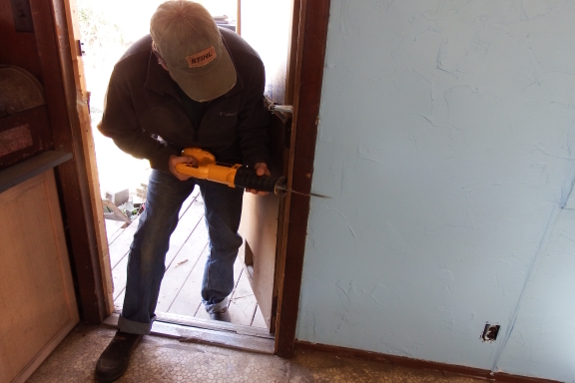 The door frame was also going to impact sofa placement, so Mark cut a notch with a sawzall. 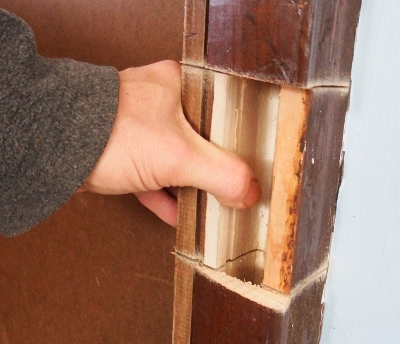 You might not want to try this at home in a real house. But trailers are so underbuilt they're easy to manipulate. Turned out that what looked like a massive hunk of wood was actually a hollow piece that was easy to pry loose. 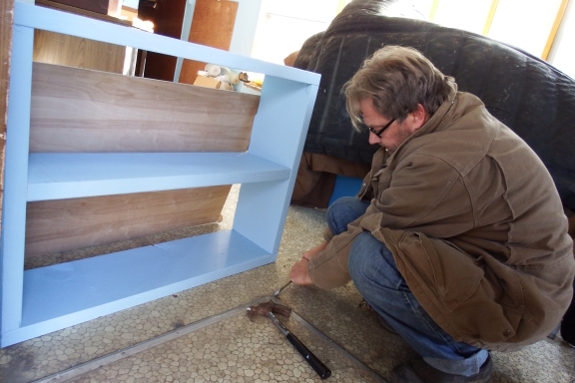 We set the plywood box on top of the bookcase and legs and tapped it into place. ...and a two-by-four at the bottom to finish bracing the structure. 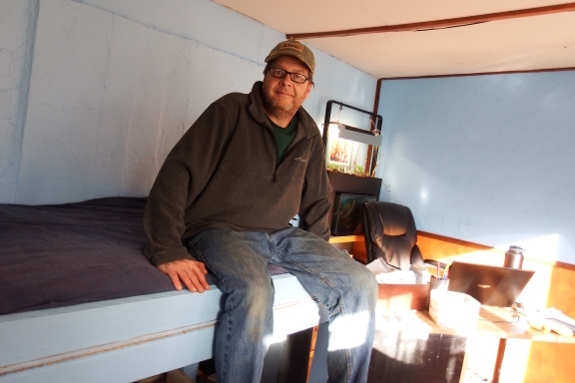 He also added a two-by-four set on edge on the front of the bed platform to hold the mattress in place. Add in a memory-foam mattress (half the cost of the entire project), and Huckleberry was ready to check the new lounging station out. It's great fun to sit a little higher and view the world from a new angle, although we might have to do something about heat in the summer months. 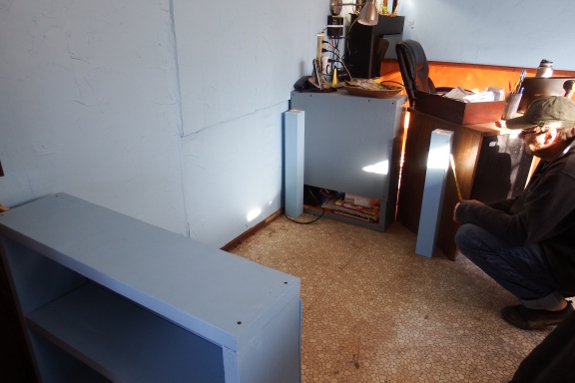 In the meantime, we're pondering where to put a step to make the top easy to access and what to do with the storage space underneath. As Mom suspected, it's a little too low for winter-coat hanging and Mark's not sure about my idea of turning it into a seed-starting station. We'll see what happens after we've lived around the new piece of furniture for a few weeks. My old Muck boots were 4 years old and starting to leak on creek crossing days. I upgraded from the chore boot to the Hi-Cut MuckMaster. I think the extra height is worth the extra money and I like the way the MuckMaster hugs the calves compared to a big gap with the chore boots that would sometimes get water splashed up and into. 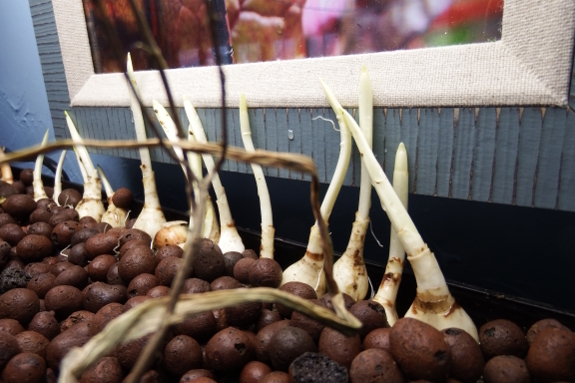 The good news is that the plants in my aquaponics setup are doing well. One celery transplant bit the dust, but everyone else is either hanging in there or actively growing. I even dug some daffodil bulbs out of the yard for faster prettiness --- 24 hours after taking the photo above, their leaves had already turned green and begun to grow. The bad news is that I'm having a harder time getting the chemistry to even out. Half a cup of pee was apparently way too much, and I soon discovered that urine also tends to dramatically raise the pH of the water as the urea decomposes into ammonia. So I had to change out about half the tank's water to get down to an ammonia concentration of 6 ppm and will be slowly adding lemon juice to bring the pH back on track as well. 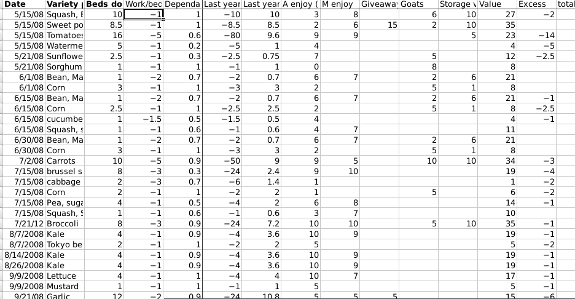 All-told, though, I'm thoroughly enjoying my experiment so far. The hourly pump action is a handy clock, and the sound of running water soothes me even as it reminds me to get back to work. All that fun and I haven't even added fish yet! 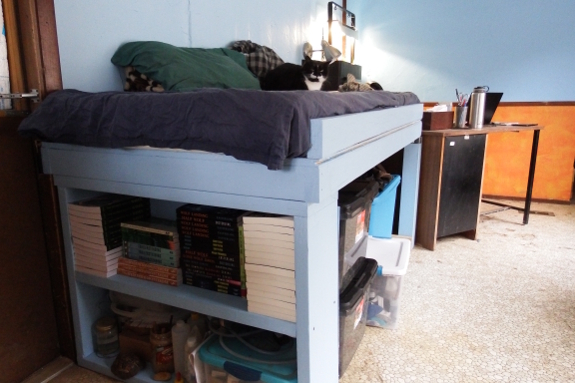 The elevated sofa project went so well we decided to make another elevated storage/bed in the bedroom. Meanwhile, the grow bed is really greening up. 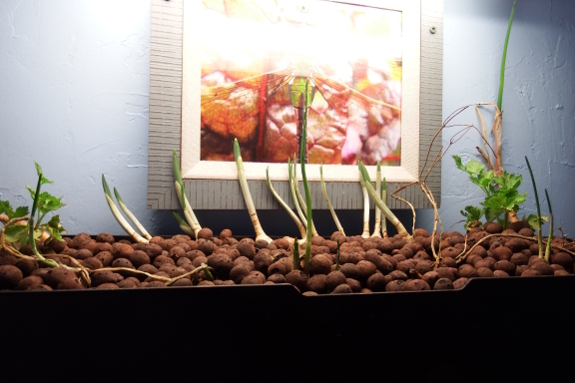 The chives have grown nearly two inches and I think the celery might be putting out new leaves. I'm excited to see how quickly the plants and bacteria work through the nitrogen and how well the ecosystem stabilizes now that it's gotten its start. Once the ammonia disappears and then disappears again after I add a second dose, I'll consider adding fish! The place we get local lumber is going to be closing in a couple months. I'm sad to see them go. They custom cut our plywood at no extra cost with a smile. "What's next?" I asked Mark once the living room remodel was basically complete. 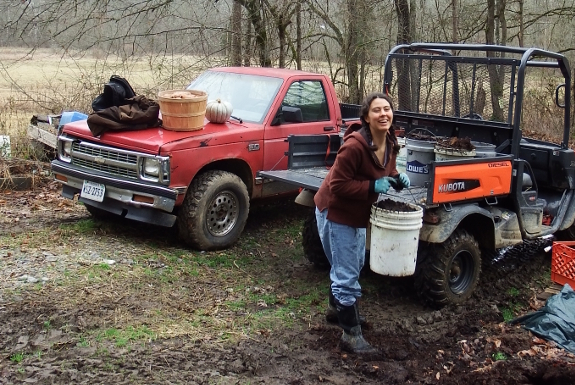 "Hauling in manure for the spring garden? 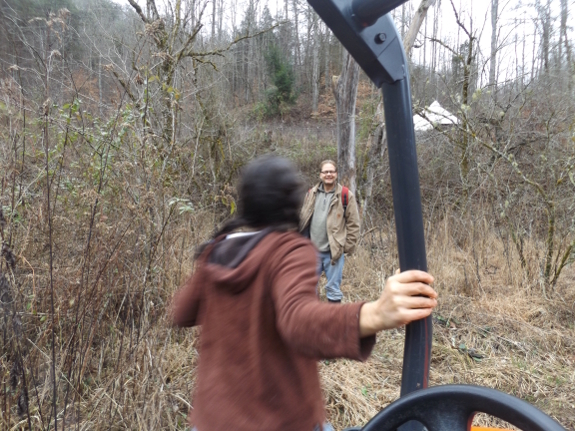 Cleaning out the composting toilet?" "None of the above," my husband replied, and I could see him thinking that he might never get me into remodeling mode again if he let me stop now. "Next up is your room." Before anyone gets concerned about the state of our marriage, I should explain that I'm the world's lightest sleeper. After battling with insomia for decades, I finally developed sufficient sleep hygiene so I mostly sleep when and where I should. 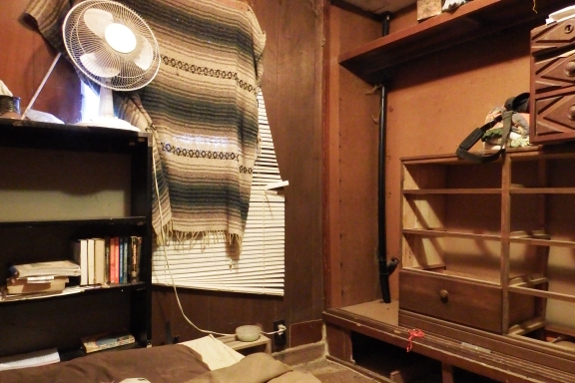 But nothing living is allowed to be anywhere near me when I sleep, and my sleeping room can be used for nothing except sleeping and changing clothes...which means it looks significantly worse than my office area did pre-remodel. Sleep hygiene, to me, doesn't seem to involve actual, well cleaning. What's the plan? Mark helped me purge about two-thirds of my accumulated possessions, then I packed the rest into bins to sit under the sofa during remodel part two. 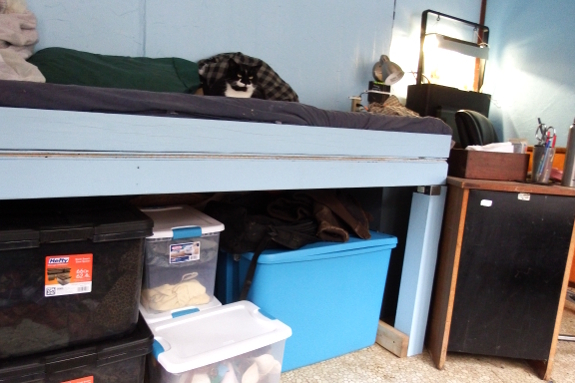 I've picked out paint, Mark brought home the lumber, and next week will be time for rejuvenation of my sleeping space! Our first Snow Capped Shitake mushrooms came during a recent dusting of snow. Our first truly cold spell of the winter hit this weekend, with two inches of fluffy snow and daytime highs below freezing. Saturday night it dropped to 7 degrees and I was worried about our outside critters. To my surprise, everyone carried on as usual. 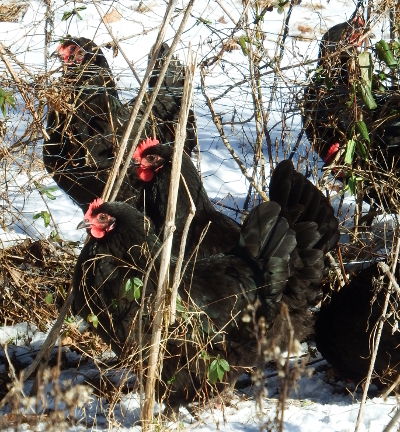 In fact, we harvested 10 eggs from our 14-hen flock --- not bad for girls who've spent the day freezing their toes outside! Winter chicken care is pretty basic, actually. 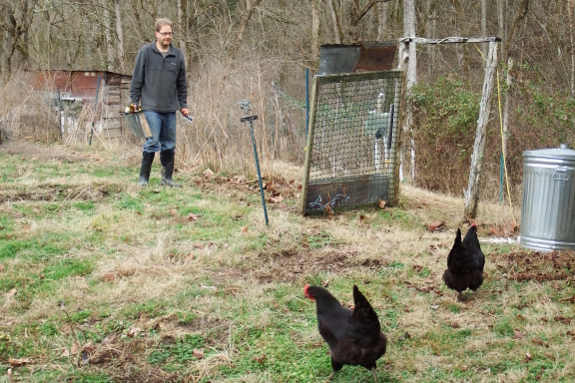 You want your chickens to be dry and draft-free (both of which are far more important than warm), to have plenty of thawed drinking water and food, and to enjoy light in the coop during part of the night to ensure regular egg harvests. Do all of that and your hens will ignore the fact they originated in the tropics and carry through quite well down to 0 degrees and lower. The Kubota X900 got stuck today about halfway out to our parking area. Really thick ice chunks get wedged in the ruts in the wrong way. Good thing it's getting warmer later on in the week. 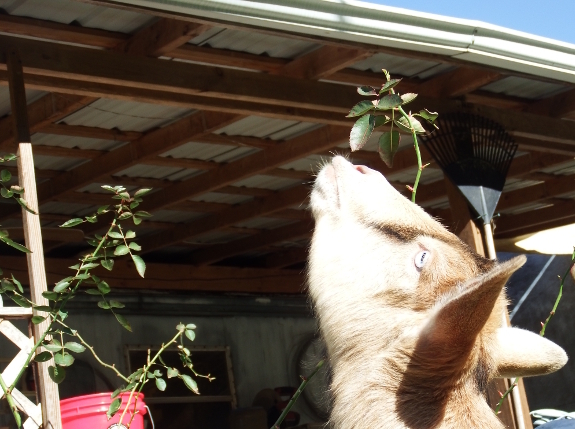 While the weather has been so cold and snowy, I've been taking the honeysuckle to the goats rather than the goats to the honeysuckle. They don't get quite as much nutrition out of armload deliveries, but Artemesia still prefers the couch-potato approach. 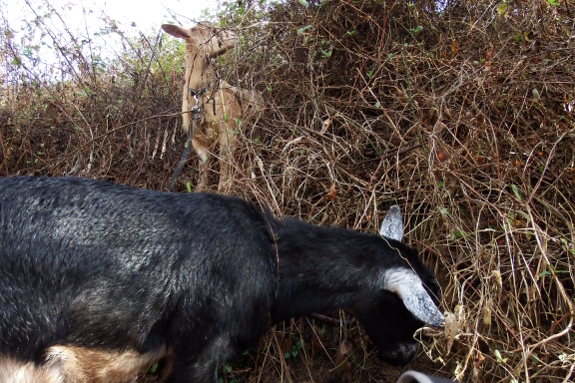 After all, she's been eating so much hay to feed her babies that she's a bit unsteady on her feet on uneven ground and doesn't feel like reaching up in search of climbing vines. 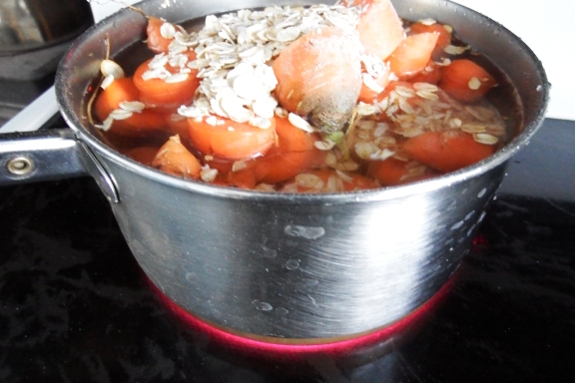 To further spoil my herd, I decided to cook up their carrots and butternuts on the coldest morning, adding a handful of rolled oats for extra carbs. Unfortunately, even after draining the soup, Artemesia still turned up her spoiled nose and required me to go home for an uncooked version. 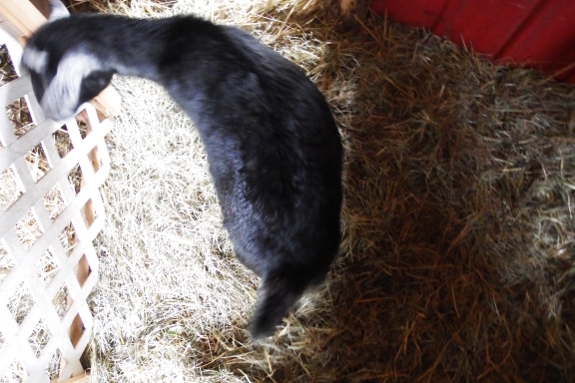 Lucy ate the discarded goodies while my pregnant doe happily crunched away on her usual cold breakfast. So much for hot mash! Happy birthday, Mark! I've only known you during one of the ten factors of your current age, but I imagine you brought peace and joy to everyone around you during the others as well. I feel so lucky to spend every day in your presence and I look forward to saying I've celebrated three of your factor birthdays with you when you're twice this age. Now my question for the reader --- how old is he? 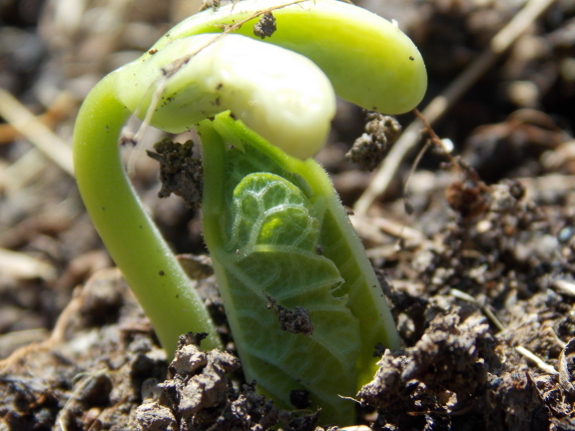 Permaculture Design Certificates can be very costly to come by, so I thought I'd share this opportunity for a program that actually pays you to learn. You spend six months studying on-site with room and board paid for, then you commit to a year of community service (that comes with a $18,000 stipend) to cement that education. In the end, you walk away with a (presumably) very deep understanding of the topics plus that certificate which can help you make a living by teaching or consulting. Interested? Check out their website and work up your resume fast because applications are due February 1. Good luck! I end up doing 90% of the wood splitting with the biggest wedge. Makes me wonder if an even bigger wedge would split faster? 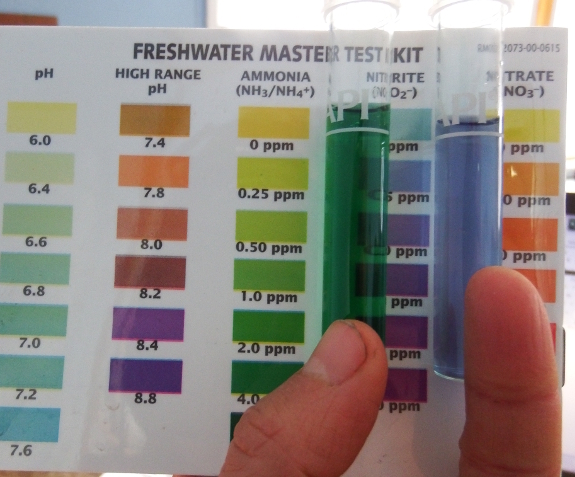 Back when I was first getting the pH and ammonia levels in my aquaponics tank close to recommended values, the water went crystal clear. I'm now realizing that sparkling water is actually a bad sign in aquaponics. 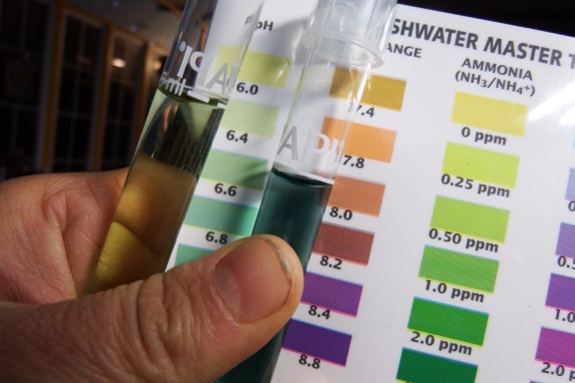 In contrast, as soon as I did a partial water change and began seeing both nitrites and now nitrates in the water, turbidity levels rose once again. Those nitrogen-converting bacteria --- not stirred up sediment --- must be what's causing the cloudiness. 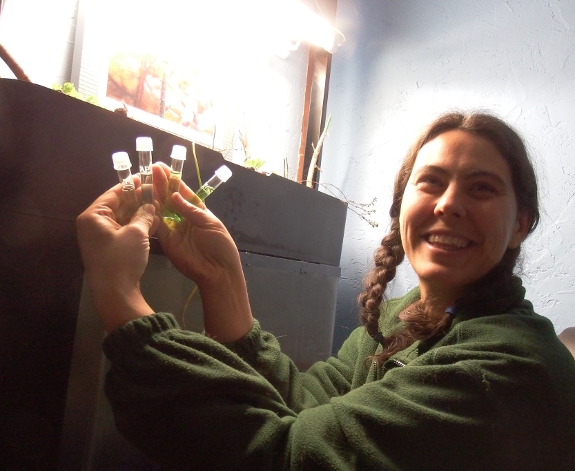 I'm thrilled to be able to see my microbial partners as they work! 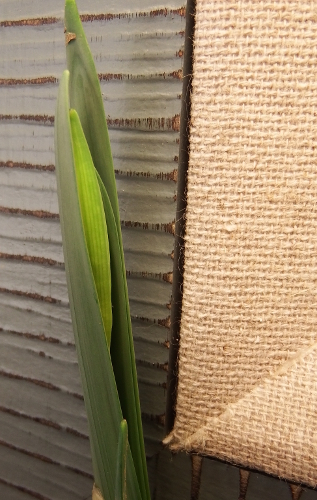 In other news, one of my forced daffodils is already sending up a bloom bud. Looks like my grow bed is going to turn pretty sooner rather than later! 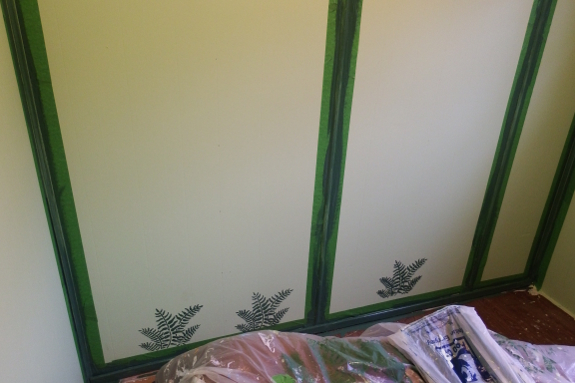 A thin sheet of plywood on two hinges makes a good plywood curtain. Sometimes a full moon shines too much light in this window for sleeping. 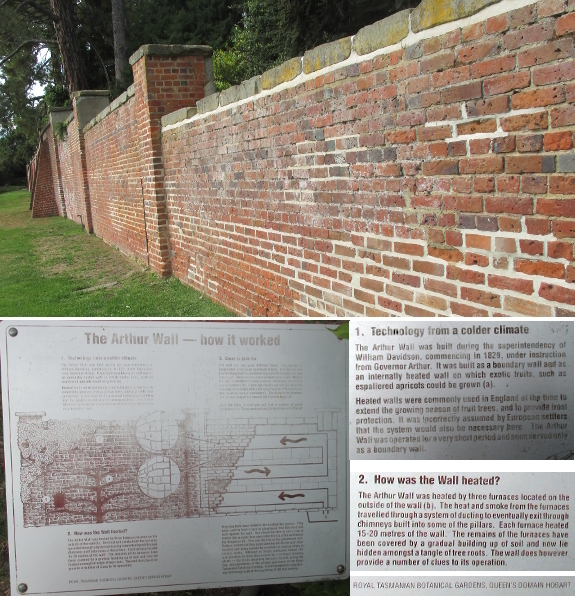 Joey took these great shots of an Arthur wall --- a heated wall to train espaliers against for freeze protection. Since fruit plants need lots of light, you'd probably only plant them against the south side (or the north side if you lived in Tasmania where these photos were taken). So what would you put on the opposite face to utilize all that heat? Perhaps a chicken coop to up your egg production? How long was the Kubota X900 stuck earlier this week? Just a couple days. The ice melted enough to crush through the big chunks. I think we could've busted up some of the ice with a spud bar to get unstuck but we were on our way to the dentist for a cleaning and didn't want to be late. 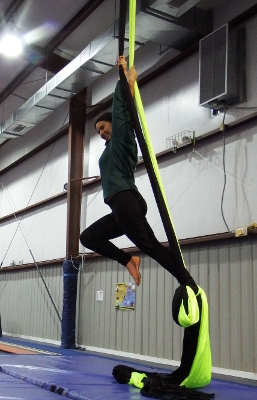 "Wanna go to circus school with me?" I asked Kayla one day last week. "Um, sure?" responded my long-suffering friend. 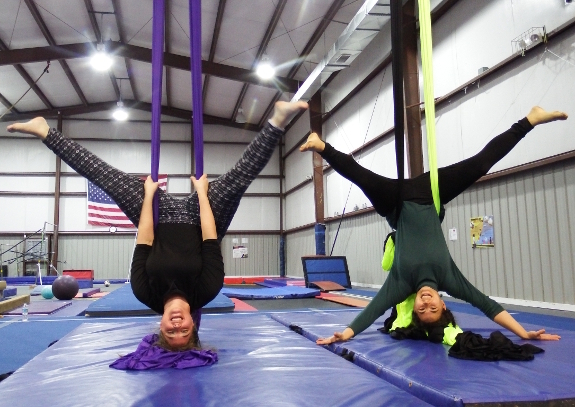 Aerial silks was surprisingly fun --- the hour flew by and I'd be a regular if the gym wasn't located an hour from our farm. Here's the link in case anyone else in the area wants to run away and join the circus. Kayla: "That was definitely a once-in-a-life-time experience." Anna: "Is that the polite way of saying you aren't going back?" Our big carrot harvest of 2016 continues to feed us and both Aurora and Artemesia. The trickiest post of remodeling (for me at least) is deciding how much of a perfectionist to be. For example, in the bedroom there's a lot of water damage in the ceiling tiles from a leak that came before our time. I'm sure the pros would have told us to rip the panels out and replace them...but instead I just laid down a coat of primer and then a coat of paint. 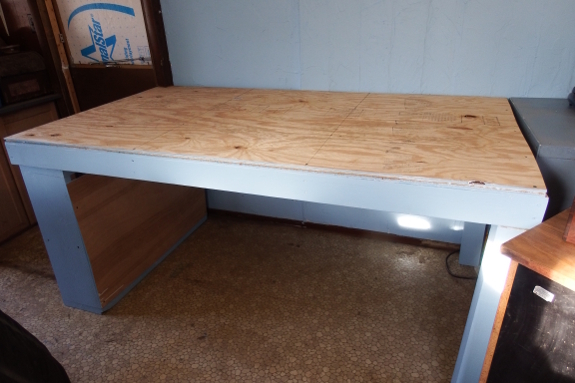 Similarly, I decided not to deal with the indented lines of the wood paneling and even avoided spackling over nail holes. This room will see low use during daylight hours and will generally be viewed under low light, so less disruption of my sleep during remodel trumps polished perfection. 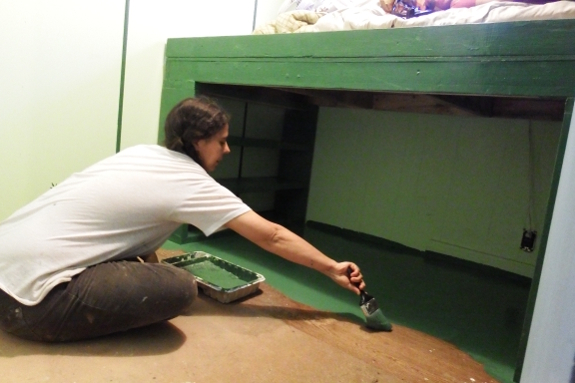 Plus, it lets me get to the fun part faster --- painting! Mushroom Mountain is now offering online courses that include on demand and live webinars. Anna and I took a class from Tradd Cotter in Asheville and were very impressed with his teaching style and content. But Saturday was so beautiful, Artie seemed more willing to go out. She gamely climbed up onto the rise that separates our trailer from the floodplain and everything was delightful...until the time came to get her down. Then I had to beg her and tease her and even pull on the leash a little bit. 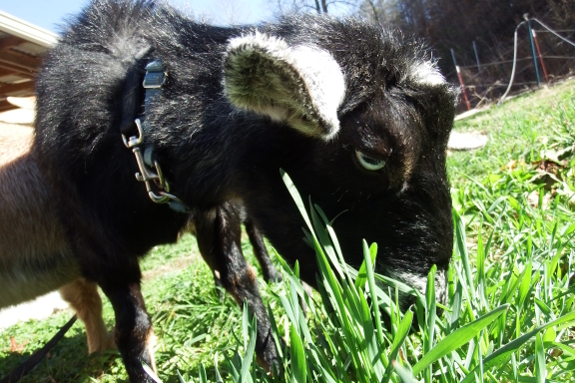 But I'm sure the sun still did her good and all that fresh forage will be much appreciated by her growing kidlets. Finished up the elevated bed platform this afternoon. It went a little faster than the couch thanks to some improved building skills. When Mark and I went to pick up the bedroom paint, there was a new type of painter's tape beside the traditional blue stuff. 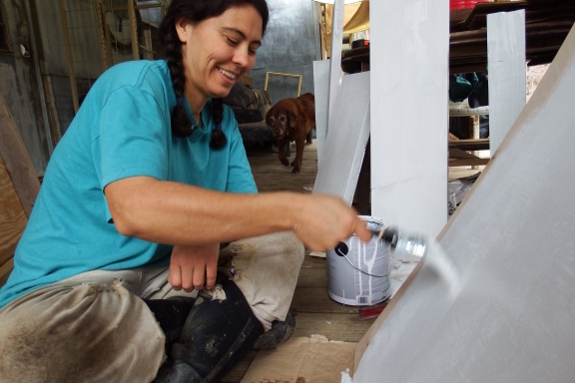 "Frog Tape: Keeps Paint Out. Keeps Lines Sharp. 10% Bonus Length." the advertising read. Plus, it was a dollar cheaper than the blue stuff. I bought a roll. So did the product live up to its claims? I didn't do a side-by-side comparison, but I'm not sure I'm sold on the Frog Tape. I masked off either side of the raised ridges we'd decided to paint a darker shade of green about 18 hours after slapping on the final coat of pale paint. But when the time came to take off the tape...it took off some of the dry paint behind it as well. Meanwhile, the crisp edges didn't really materialize (although they might have been a little less blurry than what I would have gotten with blue tape). To cut a long story short, I'll be doing some touch-up work when it's all said and done. 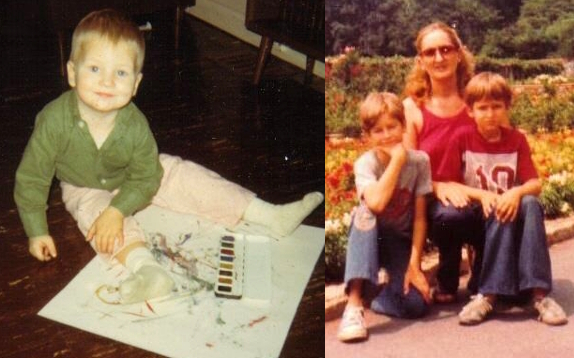 Oh well, it's hard to complain about getting to play with paint! 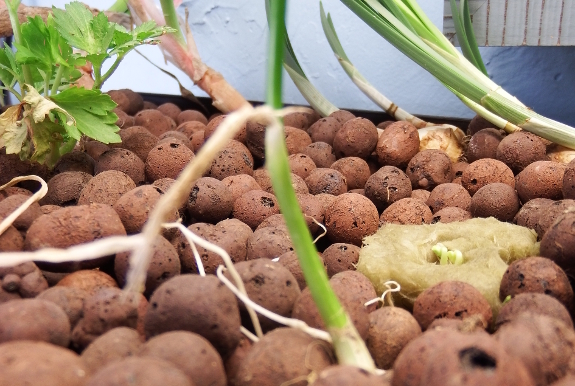 Our first touch of color this year showed up in the form of an aquaponic daffodil. While I was sick this past summer and fall, I doubted everything about the homestead (well, everything except Mark and Artemesia). Now that I'm bouncing back, it's easy to settle into old patterns. But I've decided to be smart instead and make the necessary changes so I don't go down the same dark road again. 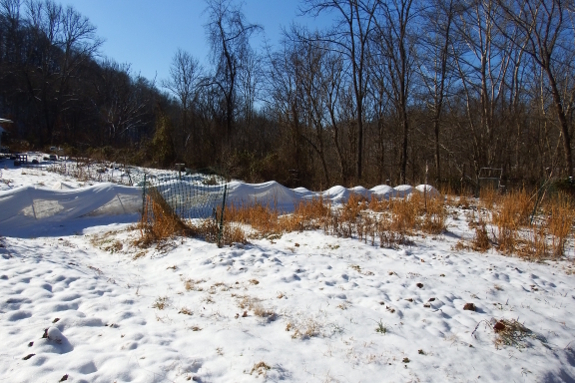 To that end, my garden ambitions this year are extreme --- I hope to cut back my work by 50% while still feeding us most or all of fresh produce we eat. Spreadsheets to the rescue! 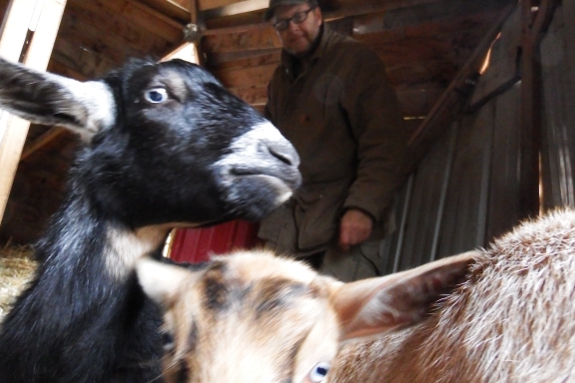 I suspect we'll end up having to buy a few more goat carrots, onions, and possibly winter vegetables. But otherwise we should still be eating primarily off the farm for the entirety of 2017. Final estimates: garden square footage will reduce by 43%, yields will reduce by 38%, and work will reduce by 50%. I hope this means joy will also increase by 100%. Stay tuned for more details as the project progresses. 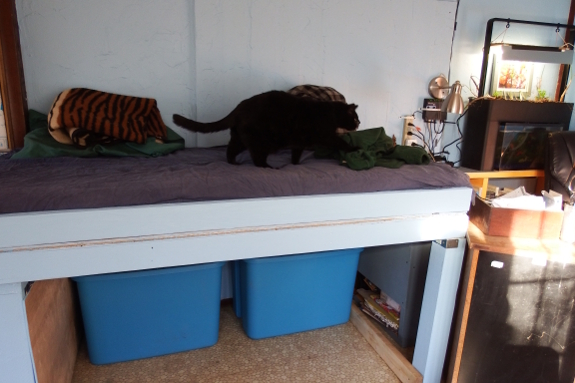 The new elevated bed needed an elevated shelf for the night time fan. One renegade hen got into the mule garden last Tuesday. "Whatever. It's winter," I said. The next day there were two. Then three, and the mini flock got bold enough to wander to the front garden on the far side of the trailer. Long-suffering husband stood in the garden for half an hour and waited to see what was going on. Sure enough, renegade number one was flying up onto the top of the gate and over, followed by her sisters. A piece of tin, one more chase of pesky fowl out of the yard...and the next day Rogue 1 was back in the garden. How's she getting in this time? 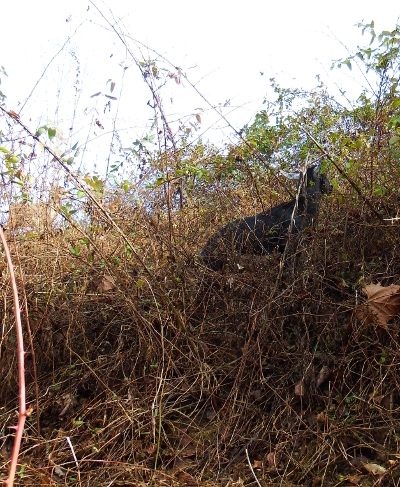 We made a major goat discovery today. 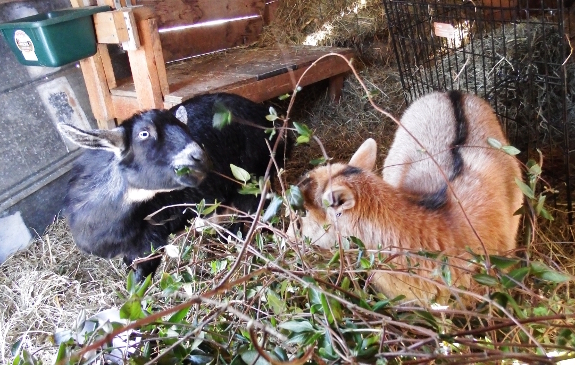 Artemesia will eat all her copper bolus with a little trickery. Cut a dried fig in half with a gram from the copper bolus in both halves. A little more paint and the bedroom is done. It's tough to take a comprehensive photo of such a small space (literally about twice the size of a twin bed), so here are a few shots from each direction as a sort of tour. The raised bed gave me plenty of room for storage. Books by me (multiple copies of each, so they don't need to be easily accessible) go in the bookcase support while bins of clothes and ancient journals/sketchbooks are safe in mouse-proof bins. 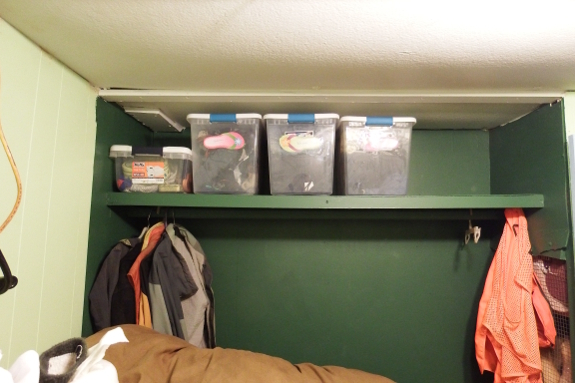 The closet is pretty empty at the moment, but I'm just thrilled to have finally found the spot where rodents were entering my sleeping space. 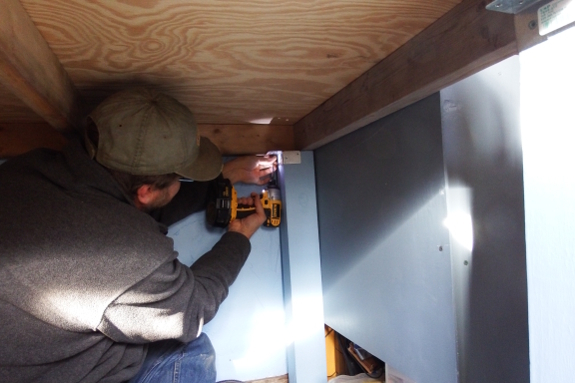 Down beneath a built-in cabinet, we discovered a four-inch hole that Mark has now filled in with wood and liquid nails. No wonder that corner of the trailer was mouse central for the last decade! 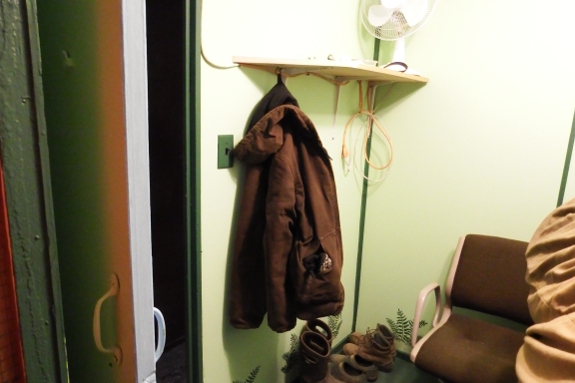 Better yet: my boots and winter coat finally have a home other than draped-over-that-chair and tossed-in-that-corner. Here's hoping that cutting down my possessions to the ones I really use and giving each a place will prevent future clutter. For now at least, it's a joy to have everything so shipshape. My aquaponics experiment is a slippery slope. I started out with easy herbs transplanted out of the garden (plus a few daffodils for color), and all they needed was the tiniest of fluorescent lights overhead. But as the ammonia got converted to nitrite and the nitrite to nitrate, I realize the error of my ways --- herbs aren't hungry enough to use up all of the nitrogen in my tank. So I've added some greedier plants, starting these from seed because I don't have any heavy feeders in the garden at the moment. Cucumbers and summer squash, plus some basil and parsley to round out my herbs. It's been a year since we moved our firewood station closer to the back door. I would guess we've saved a couple hours when you total up the time saved. Did I ever mention that I love manure? Mix in a healthy helping of high horsepower Kubota action and fertilizing the garden has never been so easy or so fun. Thanks for coming over and taking pictures, Mom! Your wonderful presence and all those delightful bags of leaves were much appreciated too. Next time, maybe I'll let you drive. We harvested enough shitake mushrooms today to last several meals. Might be our biggest shitake harvest so far. Aurora's feet are now half again as big as her mother's. Strange since our little girl is only 1/4 Nubian (and 3/4 Dwarf Nigerian) while her mother is half and half. But I think getting as much milk as you can handle for the first seven months of your life might turbo-charge you forever. In fact, I can see inklings that Aurora is going to be our new herd queen before too long as her size begins to outpace her mother's. Here's hoping she keeps some of Artemesia's sweet temperament despite the transition and doesn't turn into a bully. We broke our big splitting wedge today. A little chip off the side makes a big difference in getting the wedge started. The medium size is almost as good requiring about 20% more elbow grease. Except for that one cold spell a couple of weeks ago, this winter has been unbelievably mild. I've taken the change of speed as a personal favor from the weather gods and am enjoying every moment of the sunny days. Apparently, the plants and animals feel the same. I heard a chorus of wood frogs calling in a sunny spot down the road last week (although they quieted back down a day later) and the honeybees have been out flying every warm afternoon. 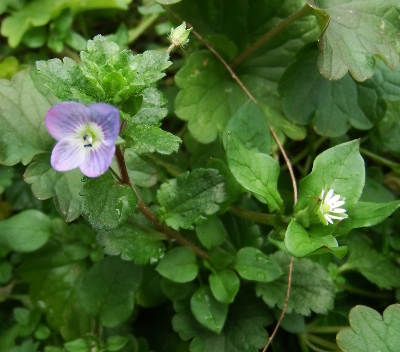 Sunday I figured out why --- the speedwell and chickweed are in full bloom! 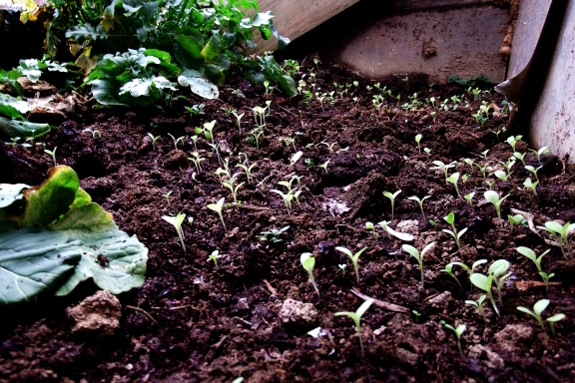 Meanwhile, in the cold frame, lettuce seedlings are up and growing. If the warm weather holds, maybe we'll have a Valentine's Day salad? Artemesia needed some Thiamine today. She's been feeling a little less than 100% the past few days. We're crossing our fingers that she will start to feel better soon. 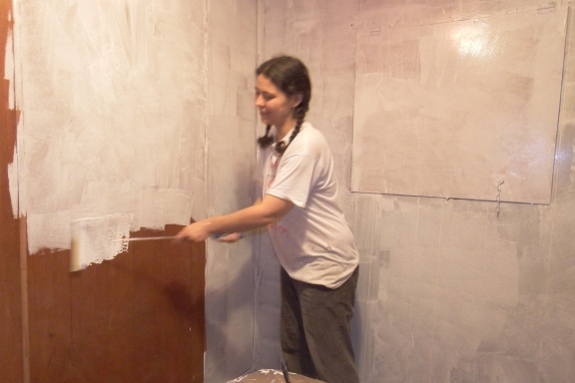 I'd been resisting putting anything on my newly painted walls. 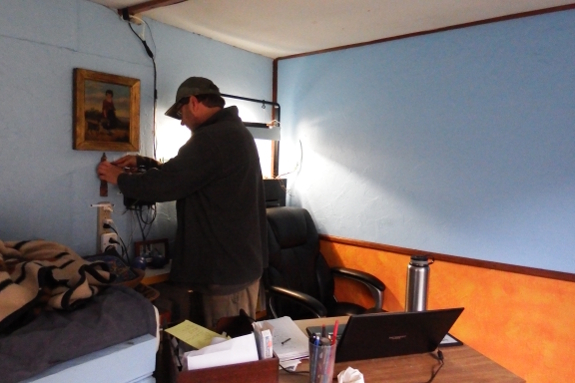 But the edge of the office ended up turning a little wire-filled, between a router and a charging station for all and sundry. Mark had the bright idea of hanging up two small family heirlooms to draw the eye away from the electronics, and I think he was right. 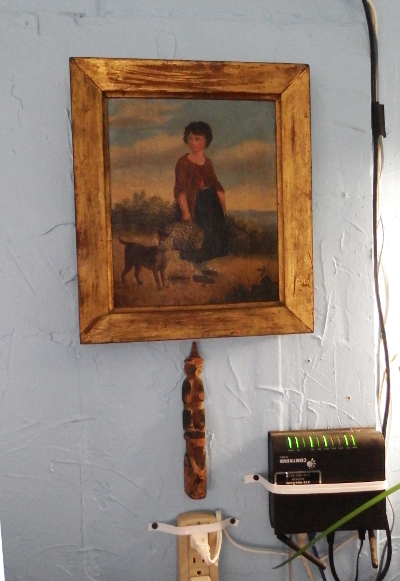 One ancient painting of girl plus dog/goat plus one hundred-year-old Alaskan totem pole now make a transition between our aquaponics station and the room at large. Everything else, though, will remain bare (for now!). We got some seed in our straw again....arghhh! It seems to have attracted rodents which prompted some aggressive digging on Lucy's part which then needs to get fixed before the cold weather sets in. Artie's sick and it's my own fault. Here's hoping Mark's TLC will fix what I broke. What did I do wrong? When I was under the weather this fall, I didn't pay enough attention to Artemesia's fat levels. She was losing weight, but I figured if I stopped milking her the decline would turn into an incline. Unfortunately, Aurora kept nursing on the sly and her mother got thinner and thinner. By the time Artemesia finally weaned her daughter, it was the end of November and she'd been bred --- more hungry children sipping away at her fat stores. 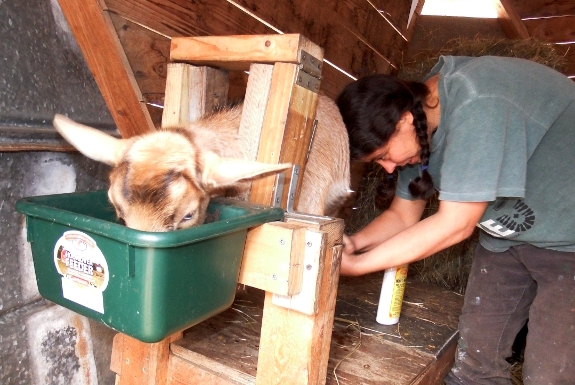 I tried to counteract the depletions by increasing her concentrates...but I'm now realizing that actually knocked her gut bacteria out of whack and ruined their ability to create that all-important goat vitamin: thiamine. Monday we were flooded in and unable to do anything about it. But Tuesday I sent Mark to the vet to get thiamine and penicillin (the latter is to treat the related listeriosis, which is an unlikely counter-diagnosis, but possible). 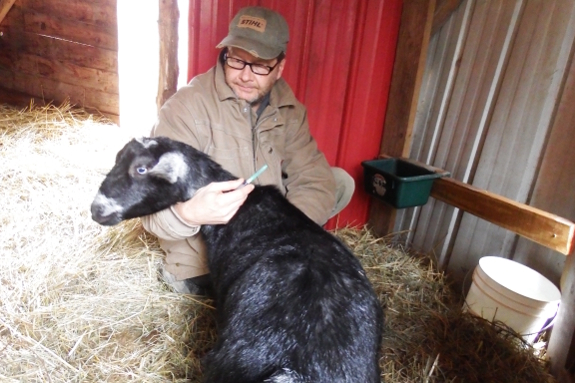 Then my long-suffering husband got to learn to jab needles through tough goat hide...two needles four times a day until she's healed. A day and a half in, we're seeing heartening signs of progress, but still plenty of spinning. I'll keep you posted as Artemesia (hopefully) rebounds back to her usual cheerful self. Artemesia is feeling a lot better today. The circling has decreased and her appetite is improving. I'm slowly getting better at giving her shots. Sure enough, our reader was right. 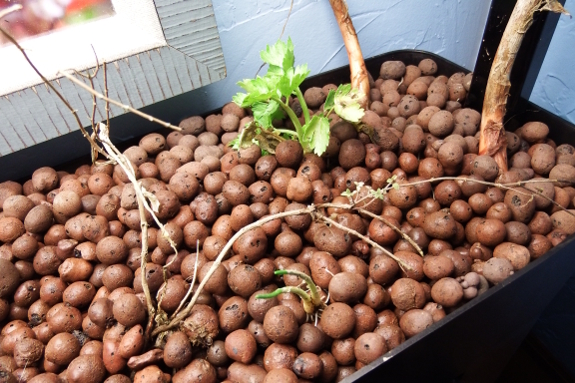 Our aquaponics setup didn't need more plants --- it just needed a little more time. 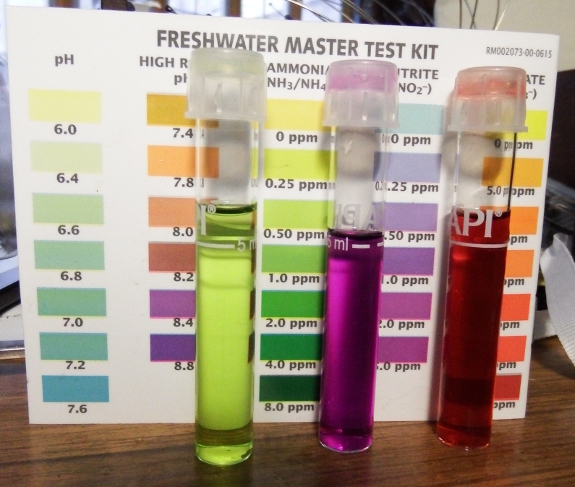 Six days after my previous test, I tested again...and found ammonia, nitrite, and nitrate levels were all close to 0. Success! Time to choose some fish. I've narrowed it down to three unlikely-to-fail options. Perhaps those of you with more aquarium experience can chime in? Option A: 4 Danios. I understand this might be pushing the limits of my ten-gallon aquarium, but I might get away with it if I choose short-finned varieties that are less likely to be picked on. Danios are reported to be fast swimmers who enjoy dancing around the upper limits of the tank. Option B: Three guppies (two females and a male) and three dwarf cory catfish. This would be a busy tank since the guppies would breed (and then eat their babies) while the catfish would play around near the bottom. Downside --- I might need to change out my existing gravel bottom for sand for the sake of the catfishs' tender mouths. And will I fall into the trap of trying to give all those baby fish away? Option C: A single betta for peak beauty (although lower activity levels). Possible problem --- the beta's beautiful fins and tail might get caught in the intake of the pump since the species isn't good at handling rapidly moving water. I took this picture a couple weeks ago after a flood. 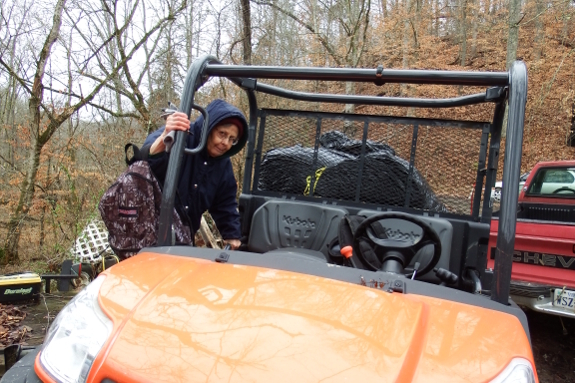 The water level goes up to about half the tire height of the Kubota X900. It could handle a little deeper but that's our comfortable limit. Coming home is one of my favorite parts of our farm. Whether it's Mark returning from town (caught by Mom in this photo as I drove her back out to her car) or me returning from the wide world and soaking up the richness of our environment, there's nothing quite so wonderful as diving back into the beauty and tranquility of our trailerstead. Winter gray or summer green, Lucy and farm both welcome us with wagging tail. Perfection! 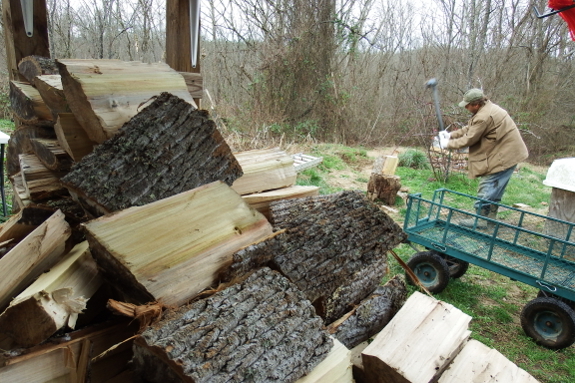 I've learned my leason about using felling wedges for firewood splitting. It worked good in the beginning....until the plastic came up against heavy knots. We ordered the above steel wedge. Stay tuned for a full report. After deciding my aquaponics system was (hopefully) fully cycled and ready to deal with fish poop, Kayla and I went to pick out our new livestock. I opted for one male and two female guppies, plus a tiny cory catfish. The catfish is actually my favorite --- it doesn't have pretty colors, but it swims here, there, and everywhere and keeps me amused. It was a little tricky to float my pet-store bag in the fish tank since the grow bed usually sits about half an inch above the top of the aquarium. I had to get Mark to lift the grow bed while I slid cinderblocks under the legs to give me room to play in there while introducing the fish to their new home. After removing the bag, we returned the grow bed to its usual elevation. Fingers crossed the entire school survives life in a new tank. 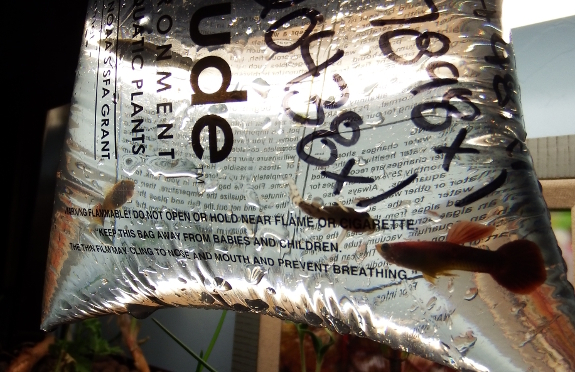 Anyone want baby guppies in about a month? We started on the 2017 garden this week by adding some buckets of horse manure. Artemesia was finally feeling well enough Saturday to come out and graze. What a relief! Aurora says, "It's about darn time! Let's see if I can catch up on a week's worth of trouble in an hour." We got enough snow last night to make the extra long quick hoop sag. Taking off the pressure helps to extend the life of the fabric and give the kale a little extra sunshine. In late January, two and a quarter inches of snow melts awfully fast. 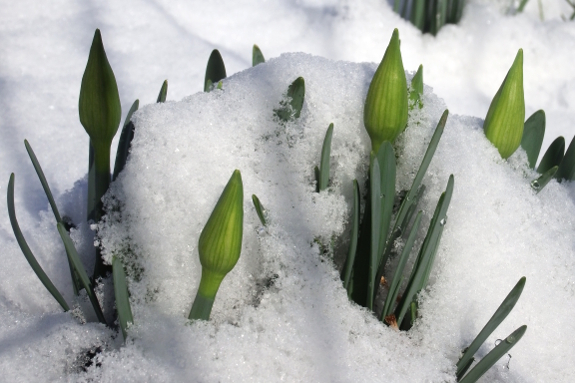 Even with temperatures hovering in the mid thirties, the sun is bright enough to uncover daffodil buds by lunchtime. When do you think they'll open up? I finally put the finishing touches on a short film I made for Directing class. It was great working with all the people involved and learning the process of film making. We shot it on a Lumix DSLR at 4k and recorded sound with a Zoom H4N. 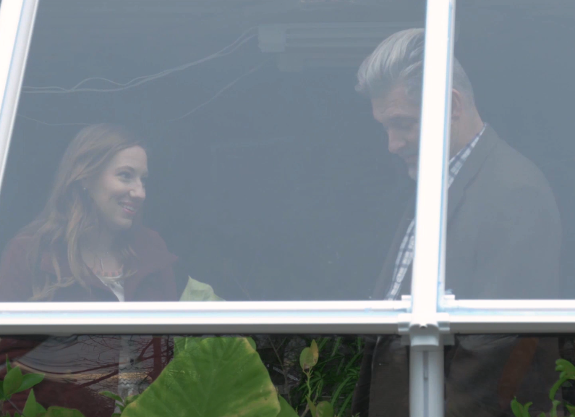 Bittersweet Lemons is a short film about how caring for a sick lemon tree helped to heal a broken relationship.